Emily practices physical therapy at the UW Health Rehabilitation Clinic. Her area of practice is in neuro rehabilitation, working with people with a variety of neurological conditions such as MS, Parkinson's disease, traumatic brain injury and stroke. She has a special interest in working with people with vestibular impairments and dizziness, and is certified through the APTA for vestibular rehabilitation. 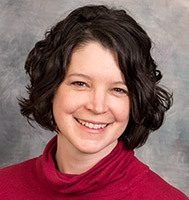 She also work with the geriatric population in falls assessment and prevention and works at the Geriatric Falls Clinic at the UW Health University Station Clinic. Emily holds a Master's of Physical Therapy from the University of Wisconsin-Madison.